At Towing Solutions we offer fuel delivery service 24 hours a day, 7 days a week to all the residents in the beautiful city of Fontana, CA. Running your car out of gas can be a huge headache. Not only is it a dumb mistake that could have been easily avoided, it could also do serious damage to your vehicles fuel pump witch would lead to you wasting much more time and money. If you find yourself in this predicament please don’t panic. Towing Solutions is here to help! All you have to do is give us a call at (951)445-8868 answer a few simple questions from our dispatcher to help us help you a little better. The dispatcher and driver will then take care of the rest. There are millions of reasons why you didn’t stop to fuel up before heading out on the road. Maybe you were running late for work and didn’t have time to stop for gas? Perhaps the gas prices were too high in your area and you were looking for a better deal? Or maybe your gas gage is failing? It says you have gas when you really don’t. What ever your reason may be for not fueling up is irrelevant at this point, the fact still remains the same. You ran out of gas! 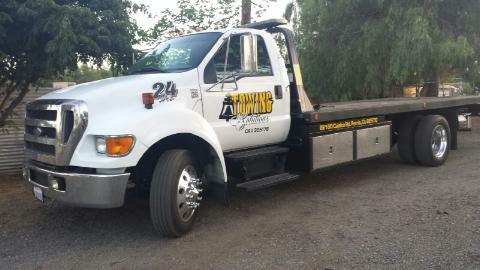 For fuel delivery service 24 hours a day don’t hesitate to call Towing Solutions at (951)445-8868. Below are a few easy tips to follow in case you run out of gas while on the road. Turn flashers on immediately to alert other drivers. Pull to the side of the road/shoulder. Keep all your passengers calm and in the car at all times. The majority of newer model cars and trucks have their fuel pumps in the gas tank. The fuel pump is surrounded by gas and is actually cooled by the gas itself. When you drive your vehicle until its out of gas you run the risk of over heating the fuel pump and causing it to fail. It’s always better to just stop and fuel up. It will save you time and money in the long run.